Today I was back at Mt. Irenaeus after a week away. Today was the culmination of a Franciscan Sojourners retreat and though I was not a part of the retreat there were many familiar faces among those that were there for that event. Fr. 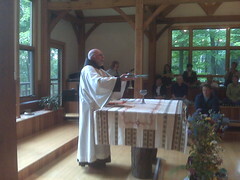 Dan Riley, OFM is an eloquent homilist and today he was really tuned up. He took today’s Gospel and talked about coming away to a deserted or quiet place. He talked about eremo and its place in the Franciscan tradition of coming away to quiet places, not to hide from the world but to more fully engage it. His homily came to me at a time when I’d been thinking about those subjects a great deal. I mentioned in our sharing time that I thought that the world is not broken, but that we are and and that being broken is a good thing. Brokenness is a strength and something to be sought after, because it is only when we are broken and poured out that we are open to the Gospel message. I thought to of the story of the cracked pot and how due to its defect it actually watered flowers along the path. Our brokenness is often our strength, but too often we try to deny it. I need to celebrate and cherish my brokenness. In it lies my strength. When I am weak then I am strong. When I think I’ve got all the answers then I’m not likely to listen to what someone else has to say. I need those times of eremo to live more fully in the world. Thanks to Fr. Dan for opening up the word once again and helping us all to cherish our times of solitude. This entry was posted in Uncategorized and tagged contemplative, eremo, Franciscan, Franciscan Sojourners, Gospel, Mt. Irenaeus, strength, weakness. Bookmark the permalink.